Holiday Favorites done in an up- beat, swinging jazz style. 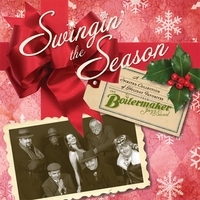 The Boilermaker Jazz Band brings you "Swingin' the Season"- a recording of joyful music for the holidays. In true Boilermaker fashion, we have taken a decidedly up-beat approach to these classics. From familiar holiday melodies to jazzed- up versions of traditional carols, these swinging tunes will inspire you to cut a rug under the mistletoe. We've taken a little bit of everything we do and applied it to these seasonal favorites- you'll hear wonderful vocals, hot instrumentals, some jumpin' boogie woogie, and even a cha- cha! For those of you who feel sentimental at holiday time, there are a couple of lovely ballads along the way as well. From the Boilermaker Jazz Band family to you and yours, we hope that this recording will become a part of your holiday tradition! “...With singer Jennie Luvv, the Boilermakers rip through 16 holiday classics. The energy never slows down." We have a very extensive holiday music collection with recordings of every genre and this was a great addition. We have enjoyed this band in live performance and they keep getting better! Thanks and Happy New Year! As a Pittsburgher I'm partial to this band - but this CD does have the best arrangement I've _ever_ heard of "We Three Kings", a carol I mostly have not liked. Between the "Sing Sing Sing" opening drum solo and the klezmer tone of the tune - that cut alone is worth the price of the album. Overall on the album the vocals are a little weaker than the instrumentals, but this is a totally enjoyable CD, easily worth the cost, and my favorite of 2007.